Recently I took on a One Room Challenge with myself (minus an actual room and no real baby). 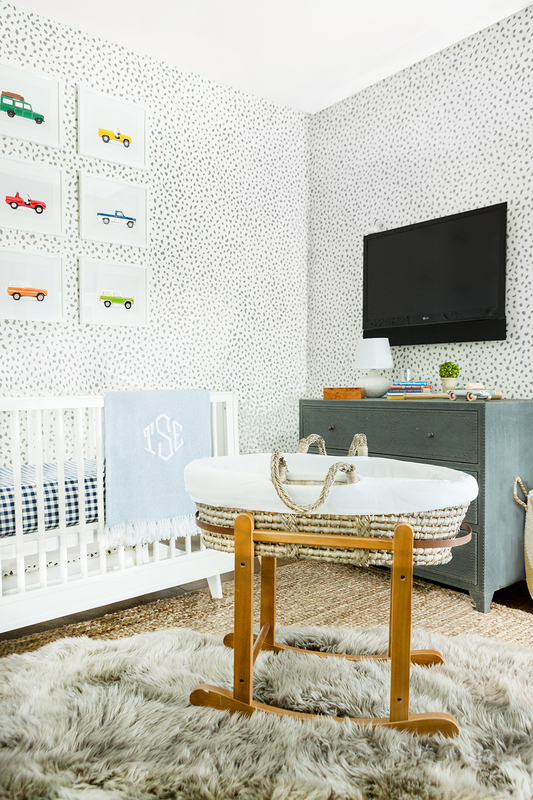 The challenge was to design a nursery for a boy around my orange Ford Bronco print. The wallpaper was the very next thing I picked out because I love seeing my cars paired with a great wallpaper. The wallpaper pulled in emerald green to the color scheme which already included orange. The obvious next color choice, to me, was navy. Who doesn't love navy? It's timeless and a true classic. Orange, green and navy....sounds good to me. For the remainder of the design, I pulled from all my favorite places. Check out the list of sources and links to the specific items at the bottom of this post. Important side note: no I am not expecting. Enjoy! Classic car meets uptown Manhattan. If there was ever a perfect nursery design, you're looking at it. 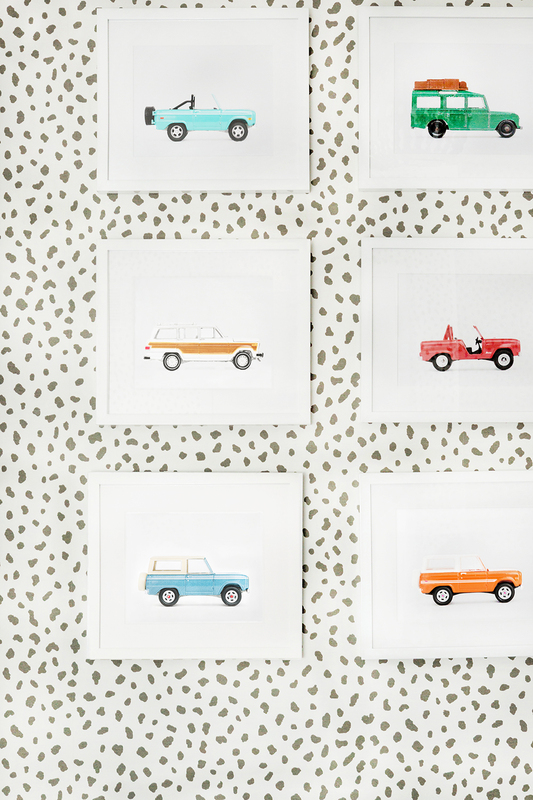 The cars have never met a wallpaper they didn't pair well with, but I must say they are too fine when paired with this TANZANIA wallpaper by Thibaut Design. A favorite part of my trip to New York to photograph art installs has been the connections I have made with fellow car lovers. I fell in love with this taxi rattle by Estella NYC the second I saw it. 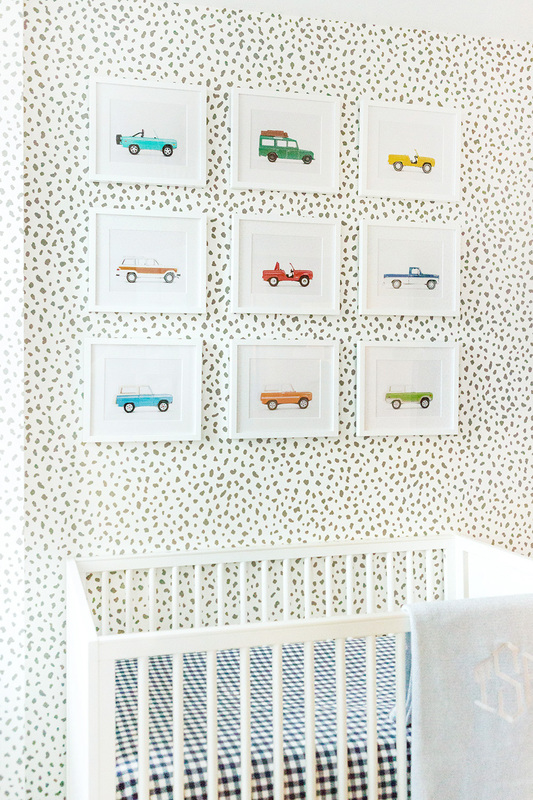 As much as I loved seeing pieces from my Car Series on the wall of this nursery, I was equally fascinated by these chic custom white shelves holding a set of arranged by color Matchbox cars on the adjacent wall. These tiny shelves were a minimalist's dream come true. Is this not the cutest little stuffed taxi you've ever seen? The perfect place to store children's books when space is limited....on the inside door to the closet. So smart. Studies have shown babies sleep better when they have Leslee Mitchell Art on the walls of their nursery. I'm just telling you what I heard. FYI. What's a art install blog post without a little behind the scenes action? Special thanks to Dolci Key (my old Nashville assistant turned NYC living model) for all these great moments captured while photographing this incredible nursery.